You can listen to Dairena’s reading here. Dairena Ní Chinnéide is a bilingual poet from the Dingle Peninsula. She is working on an album of poems from her most recent collection Fé Gheasa : Spellbound (Arlen House, 2016) with music by Steve Cooney and Rónán Ó Snodaigh. She was awarded the Patrick and Katherine Kavanagh Fellowship 2016 and is the current Irish Language Writer-in-Residence for DCU. File sa dá theanga í Dairena Ní Chinnéide a aistríonn leaganacha dá saothar féin. I measc naoi gcnuasach léi tá An Trodaí & Dánta Eile / The Warrior & Other Poems (Cló Iar Chonnacht, 2005), Cloithear Aistear Anama (Coiscéim, 2014) agus Labhraíonn Fungie (Ponc Press, 2015). You can listen to Brian’s reading here. Brian Turner is a writer and musician living in Orlando, Florida. He curates The Kiss series at Guernica, soon to be published as an anthology by W.W. Norton & Company in 2018. He’s written a memoir My Life as a Foreign Country, two collections of poetry—Here, Bullet (Alice James Books, 2005) and Phantom Noise (Alice James Books, 2010), and co-edited The Strangest of Theatres (McSweeney’s/The Poetry Foundation, 2013). He is currently at work on a second memoir, The Wild Delight of Wild Things, and an album of music with The Interplanetary Acoustic Team entitled 11 11 (Me, Smiling). His late wife, the brilliant and beautiful poet Ilyse Kusnetz, will have her second collection of poems Angel Bones published by Alice James Books in May, 2019. He is the founding director of the MFA program at Sierra Nevada College. You can listen to the contributors to Five Words Vol XI here. 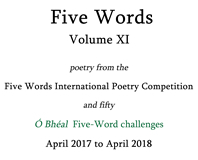 Ó Bhéal’s 11th Anniversary event celebrates the launch of Five Words Volume XI and the winner of our 5th Five Words International Poetry competition, Jill Munro. While Jill will be unable to make the launch, her winning poem will be read on the night. Shortlisted poets will also be reading, including Margaret McCarthy, Derek Sellen, Jim Crickard and Ted O’Regan – as will contributors to our Monday night Five Word Challenges held at Ó Bhéal over the past 12 months. The anniversary open-mic is only for poems written by other poets, so bring a favourite or two! Jill Munro’s first collection Man from La Paz was published in 2015 by Green Bottle Press. She won the Fair Acre Press Pamphlet Competition with The Quilted Multiverse (2016), has been short-listed for the Bridport Prize and long-listed three times for the National Poetry Competition. Jill has been awarded a Hawthorden Fellowship for 2018. She lives in East Sussex. 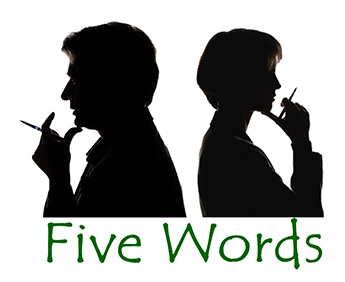 The 6th Five Words International Poetry Competition will begin on Tuesday the 17th of April 2018 (at midday GMT) and runs for 41 weeks, until the 29th of January 2019. Judges will be announced soon. 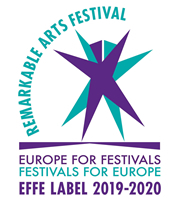 For submission guidelines and previous winners, visit the competition page here. You can listen to Anamaría’s reading here. Anamaría Crowe Serrano is an Irish poet and translator of Spanish and Italian to English. As well as having been anthologised and published widely in journals in Ireland and abroad, publications include Crunch (Turas Press, 2018), KALEIDOgraph (Corrupt Press, 2017), written with Greek poet Nina Karacosta, Onwords and Upwords (Shearsman, 2016), One Columbus Leap (Corrupt Press, 2011), Femispheres (Shearsman, 2008), and Paso Doble (Empirìa, 2006), written with Italian poet Annamaria Ferramosca. In recent years, she has been involved in several collaborations with other poets, including the Upstart project in Dublin, Steven Fowler’s “Yes, But Are We Enemies?” project, curated in Ireland by Christodoulos Makris, and Robert Sheppard’s EUOIA (European Union of Imaginary Authors) project which was published by Shearsman in October 2017 under the title Twitters for a Lark. Anamaría’s translations have been published internationally. You can listen to Ita’s reading here. Ita O’Donovan was born in Cork and now lives in Clifden. She came late to poetry and entered Jane Hirshfield’s Nine Gates (Entering the Mind of Poetry) through a variety of ways. She embarked in ongoing reading of poetry criticisms and essays by Helen Vendler, Jane Hirshfield and Seamus Heaney. She took courses with the late Dorothy Molloy and attended workshops with Medbh McGuckian, Paul Muldoon, Robyn Rowland and Pascale Petit. She reads the work of Irish, American, English, Australian and Russian poets. Her work has been published in Poetry Ireland Review, The Shop, Southword, Skylight 47, and in various anthologies. In 2017 her poetry was shortlisted for two editions of The Irish Times, Hennessy New Irish Writing. A poem has been accepted for the forthcoming issue 124 of Poetry Ireland Review. Ita reads regularly with Connemara Community Radio and at Clifden Arts Festival. In 2017 her first collection, In Deep Time – Connemara was published by The Knocknarone Press. Seán Lysaght has published six volumes of poems, including The Clare Island Survey (1991), Scarecrow (1998), The Mouth of a River (2007) and Carnival Masks (2014), all from Gallery Press. He has also published a translation of Goethe’s Venetian Epigrams (Gallery, 2008), a verse narrative of the life of Edmund Spenser, and, most recently, a prose work, Eagle Country (Little Toller, 2018). He won the Lawrence O’Shaughnessy Poetry Award in 2007. His Selected Poems appeared from Gallery in 2010. He lives in Westport, Co. Mayo. You can listen to Thomas’ reading here. Thomas Dillon Redshaw (b. 1944) studied early on with X. J. Kennedy, M. L. Rosenthal, and John Montague. Mortal (Brighthorse Books, 2017) is his third collection of poems. He is the director emeritus of the Center for Irish Studies at the University of St. Thomas where he edited the journals Éire Ireland and New Hibernia Review. He also published Well Dreams: Essays on John Montague (Creighton University Press) in 2004. You can listen to Rob’s performance here. Rob Barratt is a Dudley-born and Cornwall-based comic poet, humourist and singer. His brain-tickling, word-mangling performance combines clever word play, verse and song with satire, parody and audience participation. Rob deals with such important topics as squid, data-driven education, Neanderthal politics, the weather in Scotland, distressed furniture and tuk-tuks. In recent years Rob has appeared at folk, literature and arts festivals all over the UK and in Australia. Liz Quirke was raised in Tralee, Co Kerry and now lives with her wife and daughters in Spiddal, Co Galway. She is pursuing a PhD through Creative Practice (Poetry) at NUI Galway. Her debut collection The Road, Slowly is published by Salmon Poetry with Martina Evans referring to the collection as “lyrical and universal” and Leanne O’Sullivan describing it as “a moving study of the ways in which we mother and in which we love.” Her poetry has appeared in many publications, including New Irish Writing in The Irish Times, Irish Examiner, Southword, Crannóg, The Stony Thursday Book, One (Jacar Press, US), The Ofi Press (Mexico) and Eyewear Publishing’s The Best New British and Irish Poets 2016. Her poem “Sculpture” was included in the 2015 Poems for Patience exhibition during the Cúirt International Festival of Literature.